The town grew smaller and smaller in my rearview mirror as I cruised down the highway. The car was full of household items, the dog, and some luggage. The moving truck was already at our next home, and I was headed there – fast! It was a sad morning to pack the final things into my car (including my vacuum, which assaulted me pretty much the whole ride, since it lay diagonally between the front and back) and say goodbye to my friends. I was ready – and not a bit sad – to leave the town and the old life behind, ready to start the new. But saying goodbye to friends who tug on your heart strings is always hard, and I was a bit weepy. I saw a turn coming up ahead for the ocean, and thought for a brief second that I should go say goodbye, but I quickly dismissed the thought. Afterall, I had a long day ahead, and would be driving through storms all day. At the last second before the turn, I swerved over to make a left turn down Old Beach road. I love the ocean, and a salty goodbye was in order. The dog and I walked down the beach a bit, letting the water brush past my jeans, and the sand build up in my shoes. Taking a moment to collect my thoughts and cool my anxiety, I looked down and spotted a beautiful sea shell. I bent down to pick it up, running my thumb over the ridges to clear the sand. The top side had a deep blush color, and the back was pearly white. It was only a piece of a shell, which was enough for me. I am the sea shell, unique and colorful. Different from any other. I realized this final beach stop was exactly what I needed. It would stand as a reminder to always take a piece of time just for me. In that moment with the sand sprinkled in the palm of my hand, this beautiful shell piece caught the sunlight. The long drive ahead didn’t matter. The hard effort from closing one door and opening another didn’t matter. Leaving behind the military town for a big city didn’t matter. Life goes on regardless of what we do, so I am grateful for the reminder to slow down and take time for me. I ran my fingers over the shell and stuck it into my back pocket, turning to walk in the direction of my car.Slowly, I walked back to the sand parking lot, wiggling my toes deep into the sand with every step. Once in a while I become a gym rat. I workout for months on end, change my diet, see results. I don’t quit cold turkwy, but I slowly start eating desserts… And then a little more… And a little more. Before I knew it, I was much heavier than my “wedding weight,” and none too pleased with that fact. I started working out a few months ago, changed my eating habits, started the Flat Belly diet, and have seen great results. Energy, stamina, and much needed happiness are my favorite side effects. Oh, and sleeping better, which means I stopped taking what the doc gave me to fall asleep. I’m the kind of person who has to hit the gym every single day, or else I’ll skip one day…two…three. Every day I see familiar faces, though they are not all faces I WANT to see. There’s cupcake girl. Young (very young) and skinny (very skinny) and smells of (drum roll…) cupcakes. More accurately, she smells like cupcake icing. Hello… I’m at the gym trying NOT to think of desserts, thankyouverymuch. I thought that was bad until I started seeing G.I. Joe man. He has a small head, a giant upper body, and itty bitty legs. He always has a stressed out look on his face, and looks like he could lose his temper realll quick. I usually keep out of his way to avoid any 50 pound weights being thrown across the room like a baseball. There’s one-up-er girl. If my eliptical is on resistance 13, hers is on 14. If I change the length of my workout on the bike to 45 minutes, she bumps hers up to 46. If I do 25 situps, she does… You guessed it. Too Tall Tina and Tiny Tim. Married. She is beautiful. He is not. She is tall, he is not. They run on matching treadmills, and wear those weird shoes that are like toe-socks. A mini shoe for each toe! My favorite gym rat is Mothball Martha. At first it started innocently. I got on a treadmill next to her, started working out, and noticed it smelled like bad breath/moth balls. I looked around, and saw no one else. I tried to ignore the stench, but I glared at her a few times trying to telepathically tell her to go away. It worked, because she jumped off her treadmill, and ran to the bathroom. I guess her mothball stench was even making HER sick. When she left, the moths left. Ohhhhh but the story doesn’t end there. She started jogging again, and proceeded to hit herself in the stomach. She looked like Tarzan beating on herself. Then she kept looking around, staring at other gym rats. I myself use only my peripheral vision to observe the rats. It’s rude to stare. But how could I not stare at this crazy old lady who sits like a princess with her ankles crossed as she stares at her biceps, hits herself in the stomach, and reeks of mothballs? As much as this sounds crazy, everyone but Mothball Martha were part of an anonymous support group for me. I saw them daily, which helped me keep persevering. “If they’re daily, I can come here daily,” I’d tell myself. These strangers (and I do mean “strange”) are part of my quiet life. They keep me connected to other humans similar to the mailman, the crossing guard, the cashier. Our lifves are woven in the most intricate way with others’, and it’ a beautiful thing. It is a humbling experience to be a military wife. It seems boxes never stay unpacked for too long, before items and “life” collected in the current geographical location get dumped inside, taped up, and shipped off to a new location. From coast to coast, marsh to desert, oasis to the average, to the pits. It’s that time again for us, – yes, if this sounds like deja vu, you are correct. We just moved three months ago – but this time, big news is attached. THIS IS THE LAST TIME WE ARE MOVING DUE TO THE MILITARY! – Night life. Oh, to live in a city that never sleeps, or one that at least has a very late bedtime. Ever since I moved out of my parents house, I’ve lived in towns that roll up the sidewalks at 6 or 9 PM. Enough is enough! – Finding a job in my career field again, which leads to much much happiness for me. – Watching my husband flourish and grow as he finishes college and pursues the passions of his heart. – Coffee shops, boutiques, and clusters of people. – Attending the church of our dreams. It’s a BIG one, and the worshipping is AH-MA-ZING! Wish us luck on our new adventure. God has only the greatest in store for us right around the corner (and for you, too!). Oh, I forgot to mention, we’ll be out of here in a few days! You know what this country needs? A little lot more humor! In fact, I think we are so much in need of a sigh of relief and a gut-splitting giggle, that I think we should impeach Obama, and that Saturday Night Live’s Kristen Wiig should take over. Who wants to hear any more of the Big O’s (not that kind..) statements, all ending in his voice going up like a question. You’re the president! Make statements, not questions. A few days ago my husband and I saw “Bridesmaids,” which is hilarious. Well, actually… there were hilarious moments. Some lasted longer than others, but it was still worth my $7.50 for a matinée. Kristen Wiig makes the movie what it is, and for that reason alone, I say vote her in for President. Wiig is best at dressing up and acting as awkward characters. The more awkward, the more fun. Here’s my plan for diplomacy: instead of speaking with other diplomats, perhaps she could dress up like them in order to distract them. They would be so distracted and so busy laughing, they would forget why they are there, and will announce, “WIIG WINS, WIIG WINS, WIIG WINS,” over and over, until it is understood that after this minor tongue twister… we win! Click here for funny pictures of Wiig. Perhaps the same method would be used in the presidential race. Obama would not be distracted, he would be confused. He wouldn’t understand how it leaked that he has a twin (who was also not born in Hawaii). Wiig will help our country stay on top of the Big O. Since text-to-vote for American Idol is so popular, we can promise anyone who texts in their Presidential vote for Wiig a picture of Wiig’s bangin’ body. That should increase votes this year by, oh, about a million percent. Recently I posted about de-cluttering and cleansing a physical area (home, office, car). I hope the message soaked mentally, emotionally, and even spiritually. It is always good to cleanse our lives of clutter or things that are no longer of use to us. – Bad influences, bad friends, “fake” people, peers, co-workers. You are who you associate with. – Old habits. Instead, each day start the morning with a positive phrase about something you want to change. Example: Today I will love others like God loves me. Undeserved, uninhibited, freely flowing. How can you have a bad day after that? – Health problems. Pray healing over yourself, and evaluate what you can do differently. Diet and exercise are always good choices. Remember, a small start is still a good start to making changes. – Unhealthy situations. A certain shop attracts seedy individuals. A certain playground spot attracts trouble-maker kids, a certain internet site invites sin. Stand bold in your claim to overcome these things, whether physical or mental. If you haven’t yet, read The Power of Positive Thinking by Norman Vincent Peale. If you feel overwhelmed with making changes in your life, remember to start slow. I like to treat myself to something, and repeat to myself that “this is to reward myself for the xyz changes I’ve made.” A bright new nail polish color is a reminder of my goal. A rich cup of coffee is an emotional treat (just don’t get carried away feeding emotions rather than your body!). What are some things you need to de-clutter, pronto? Will you have to evoke the support of your family? Is it something you can start with internally? Positive wishes to anyone ready (or considering) making some important life changes. For too long, I’ve had split personalities. Not really, but hear me out. I have the professional me, the “reserved” me, vs. the fun-loving, hip chick. Ok, ok, I might not be that hip, since I’m usually dragging my heels to embrace new technology (who was comfortable with her BlackBerry for four years? Me…) and I don’t know what the heck the three-letter phrases are that kids use these days. Did you know that “HMU” means “Hit me up” (as in, text me)? So if I’m not hip, at least I have that side of me that’s funky/spunky/fun. The problem is, I spend too much of my time showing the professional and reserved self; the one who isn’t as fun to be around. Sure it impresses employers, but I’m tired of being like that all the time. I’ve decided to give up. Not on anything important, but to give up on the Caitlin who plays the roles of employee, boss, serious-business girl. Hello, freedom! I feel liberated, and can’t wait to start this new phase of life. Drake plays in the background. I’m sipping a bellini. 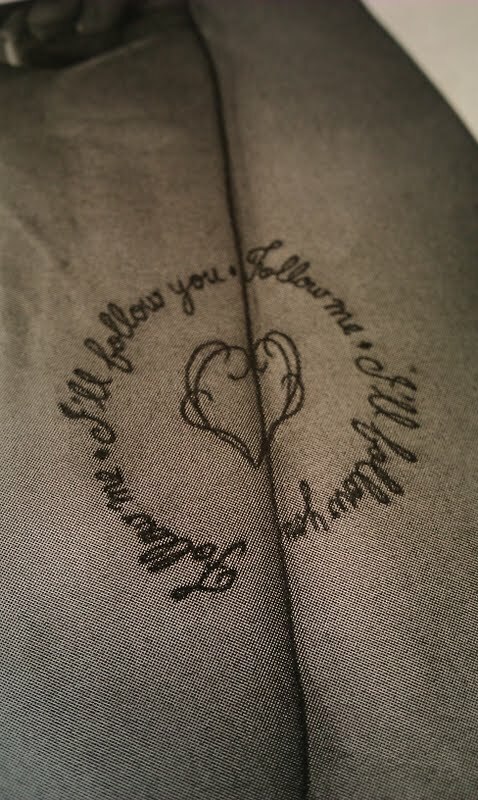 I don’t like the “follow me” crap, but I love the heart! No, I won’t be sharing my tattoo with anyone like these two love birds, but I can envision a sketched heart similar to this on my inner forearm. A lot of people have asked me, “What about future jobs you want? Will you be able to get hired with tattoos?” That’s the thing. My career field isn’t exactly tattoo-friendly, but why can’t it be? Tattoos don’t change my work ethic. They don’t change my personality or my heart. They just change my appearance. To all my fellow tattooed bloggers and readers, tattoo on. It gets old pleasing other people all the time, not leaving any energy for yourself.